When we get a speeding ticket it is a very personal event. We don’t think about overall speeding facts or statistics. We only think about our particular violation, how unfair it is (or isn’t), and how much it is going to cost us. If you would like to know the facts about speeding and get tips on how to avoid a speed trap, read on. If misery loves company, speeding facts may make you feel somewhat better if you’ve recently received a ticket for excessive speed. In the United States, about 110,000 people are cited every day for speeding. Annually, that translates into over 41 million people. Of course some drivers get more than their share. Of the total drivers on the road, over 20% will get a speeding ticket in the next year. Only 5% of speeding tickets get contested in court. Speeding is big business. Speeding tickets generate over $6 billion in annual revenues. The National Highway Traffic Safety Association (NHTSA) estimates that the economic impact of speeding related crashes is over $40 billion. Of course all speeding facts aren’t money related. The NHTSA says that in 2011 speeding was at least a factor in approximately 30% of all fatal accidents. In that year almost 10,000 people lost their lives in crashes that were speed related. Speeding facts show that the top three states that issue speeding tickets are Ohio, Pennsylvania and New York. Some tickets are the result of “speed traps”. 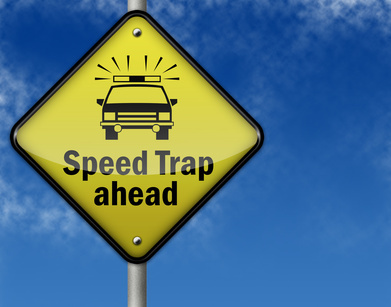 Speed traps are areas where the speed limit suddenly is reduced for a relatively short period for no apparent reason. If you want to know how to avoid a speed trap, we have some tips for you. There are a variety of apps that compile speed trap information. One such app is Trapster. Trapster compiles information from users throughout the world and there are plenty of them…over 20 million in fact. The app will warn you if you are traveling in an area known for one of its nearly 7 million reported speed traps. A website from the National Association of Motorists called Speed Trap compiles information from users and posts it for the public. If you don’t have a smartphone, this can be a useful tool. Make use of a radar detector if they are legal in your state. Be aware that many speed traps are set up at the bottom of hills, around blind corners and in residential areas. Of course one of the most obvious speeding facts is that you should simply not speed. We encourage you to obey all traffic laws. If however, you do manage to get a speeding ticket, taking a defensive driving course may help. The facts indicate that speeding costs a lot of money and costs a lot of lives. It is not something to take likely.